… the transfer between songs with their roots in the Irish or English traditions. How they were adapted by people coming out to Australia on ships to talk about their own personal problems. I got a buzz out of tracing these songs down. Plus I found an enormous spring of humorous songs. Otherwise interest in Australian bush songs and traditions appears to have been minimal in Perth during the period under review; so much so (according to Popham) that an attempt by one performer to recite ‘The Man from Snowy River’ at a folk night was summarily howled down by the audience. The W.A. scene of the 1960s was overwhelmingly American (later British)-oriented, student-based, non-political, predominantly non-professional and relatively insignificant. Just as it did the Tasmanian chapter of the revival, geography determined the scene’s cohesiveness and it is hardly surprising, given the “tyranny of distance” that only one W.A.-based folksinging act (The Twiliters) made any real impact on the national consciousness. At the same time, it should be pointed out that the Perth venues drew on a more diverse and distinguished corps of performers than has generally been acknowledged, and that the tiny scene consciously revitalised itself, wherever possible, from outside. Visiting superstars Peter Paul & Mary played Perth (more than once) as did Sonny Terry & Brownie McGhee, Odetta, even Dylan. There also appears to have been a marked degree of interaction between the Perth and Adelaide venues. (Doug Ashdown and Patsy Biscoe, stalwarts of the Folk Hut and e Catacombs, periodically graced the Perth clubs or toured regional W.A. Jim Maguire once made practical use of the lengthy train trip across the Nullarbor to acquire a few basic guitar chords before an important Adelaide gig). The Perth scene’s beginnings have proved elusive. According to Murray Jennings, western correspondent to the Sydney periodical Music Maker [Sept 1964], W.A. customarily lagged well behind the eastern states in catching up with popular music trends and so Perth was “at least a year” behind Melbourne and Sydney in establishing its own folk venues. “The folk scene emerged in Perth as Perth was just emerging out of the beatnik era … The eastern states had moved on. We used to hang around with bongo drums”, remembers Jim Maguire for whom The Kingston Trio had represented the proverbial “flash of light in the sky”. Frank Povah, who, inspired by the music of the Carter Family had discarded ukelele for guitar and autoharp, inspired by the music of The Carter Family, recalls playing at Chez Nous, a cafe “out on the highway” circa 1962. He also remembers occasional folksinging at a city wine bar (name now unknown). A striking characteristic of the W.A. scene was the primacy there of folksinging ensembles (duos, trios, etc). The Twiliters and The West Coast Trio, western counterparts to such collegiate ensembles as The Wesley Three, The Coachmen, The Green Hill Singers and The Wayfarers, were the first high profile folk-act to emerge in Perth and they remain the best-remembered performers of the era. The Twiliters had its origins at Perth’s Christian Brothers College. Kerry White and Hans Stampfer were senior classmates there. Jim Maguire, a former student, was working as a psychiatric nurse after having dropped out of First year Medicine. The boys’ first performances were at school functions late in 1962; then “we chanced upon a little coffee shop, the Quitapena”. Remembered as the first real folk venue in W.A. (“the place where it first got going”), the Quitapena was a cosy cafe in Hay Street, able to accommodate between 30 and 40 patrons. It was run as a hobby by Brian Allen, a clinical psychologist, who jumped at the opportunity to offer customers something other than taped background music. The youthful Twiliters subsequently spent two years as resident attraction there. Further up Hay Street (opposite Parliament House), the Windmill, a “musos’ hangout” run by a mother & daughter team, enabled The Twiliters to mix and share bills with local and visiting pop singers and rock bands, among them Ian Turpie. The trio’s practice sessions were initially timetabled to fit in with Maguire’s shift-work. (“When we were first starting off, we used to rehearse at 4.30 in the morning at Hans’s mum’s or the boiler room of the mental hospital”). 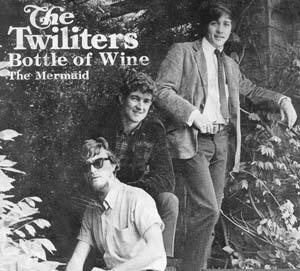 The Twiliters found an early promoter in DJ Keith McGowan and through him they became regulars on the teen TV show Club 17 and appeared to positive acclaim on Variety programs and at rock and country dances, even Hootenanny Stomps, as far away as Bundaberg. The first taste of “something bigger” came with an invitation to appear on The Country & Western Hour in Adelaide. “It was a thrill for us, young working class kids, to stay in motels”, remembers Maguire. In the wake of The Beatles’ Australian tour, Adelaide teenagers decided to give the out-of-town boys the “full treatment” at folk clubs and rock dances. “We couldn’t be heard above the screams”. (The Twiliters enjoyed a similarly frenzied response when they got back to W.A. and were booked to support Johnny Young at a rock concert in Fremantle). 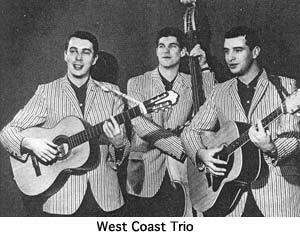 Formed in June 1963 (and drawing “Ivy League” inspiration from The Brothers Four, The Chad Mitchell Trio and The Limeliters), The West Coast Trio consisted of guitarist Nick Melidonis, a trainee Science teacher, law clerk Murray Wilkins on bass (Wilkins also played with jazz ensemble The Traditionals), and guitarist Mike Robinson, also a student teacher. Early in its evolution the trio came to the attention of John Tyrrell, a former Shakespearean actor then doing production work for the ABC, and Tyrrell provided the boys with professional experience on radio light music programs while coaching them in presentation and stage-craft. (“Tyrrell taught us how to perform rather than just play”, remembers Nick Melidonis). The boys gained additional exposure and publicity on Channel 7’s Tonight program and at a two-night poetry presentation at the Dolphin Theatre in February 1964. (Folksongs by the trio punctuated Dorothy Hewett’s reading of her own ‘Country Idyll’, Randolph Stow’s ‘Thailand Railway’, and offerings by Malcolm Levene, Merv Lilley and Griffith Watkins). Early in 1964 the WCT was recruited to “bring folkmusic” to another coffee lounge, the Shiralee, across town in Howard Street. The group specialised in boisterous renditions of folk favourites like ‘Old Dan Tucker’, ‘Chilly Winds’, ‘Children Go’, ‘There’s A Meeting Here Tonight’ or the Dylan classic ‘Don’t Think Twice, It’s Allright’, a bit of flamenco, songs from Latin America (like ‘Curimao’ from Brazil), comic numbers such as Shel Silverstein’s ‘Espresso’, and occasional settings of poems by John Joseph Jones, Dorothy Hewett or Merv Lilley. With a built-in university student following, their appearances regularly packed out the cafe.